Enstone Pre-School is a friendly, flourishing and successful charity, offering a variety of good quality pre-school care for children from birth up to five years of age and their families. First established in 1967, we moved into our own building situated in the grounds of Enstone Primary School in 1997 - thanks mainly to a National Lottery Grant award together with a lot of support and hard work from Pre-School families, Enstone Primary School and the local community. 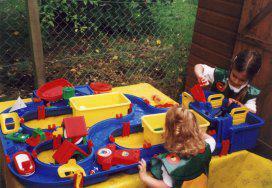 We are a voluntary committee run charity and are members of the Pre-School Learning Alliance. We are also listed as an Early Years Partner with Oxfordshire County Council and are able to accept Nursery Education Grant payments for qualifying children. We offer Ofsted registered sessional pre-school care and are registered to accept up to 16 children aged between 2 and 5 years of age. We also offer family sessions - monthly bumps and babes sessions and an integrated 'toddler' session for children aged 18+ months, where children are welcome to attend with their carers.